Like others I received an "account limited" type of email as follows. Go to (PayPal Australia hyperlink), log in to your account. Add a bank account by clicking 'Profile' and then 'Add or edit bank account'. Alternatively, click 'Add your bank account' in the notifications window. Click on 'Get verified' on the left hand side of your Account Overview page. When prompted, enter your bank details. Confirm your bank account - PayPal will deposit two small amounts into your bank account, which will appear in three to five working days. When you see your next bank statement, make a note of these amounts, then log in to your PayPal account and tell us what these two amounts are and review our bank funding agreement. This confirms that you have control of the bank account. Verify your account today and ensure that you get uniterrupted use of your PayPal account. If you have any further questions, we're here to help. Call us on 1800 073 263 and we will be glad to assist you. While my initial reaction was that it read like a phishing attempt, it was addressed to me, not "Dear Member" etc. What I did not do is click the link. Instead I found my way here. The link to Paypal apparently goes to an email page. (email-edg.paypal...) All the same it next mentions clickable buttons by which I am to add bank account details. Then it says Paypal will deposit two small amounts in the given account. I have never seen this before, at least in non-Nigerian emails! When I read "However, as a financial institution, we have to comply with laws and regulations, including limits on new accounts," I was a bit surprised. I didn't think of PayPal as a financial institution. Nor do my banks worry how many purchases I make online via their cards - other than to take an excess transaction fee. It does, however, quote a correct phone number. All in all, ambiguous in my opinion. Perhaps the plethora of scams has made me paranoid. In the worst case, if my account was limited because I fail to reply to a genuine email, I can still shop using my cards. - Is the email genuine or not? - How can PayPal make us scam-era paranoids believe their emails are real? 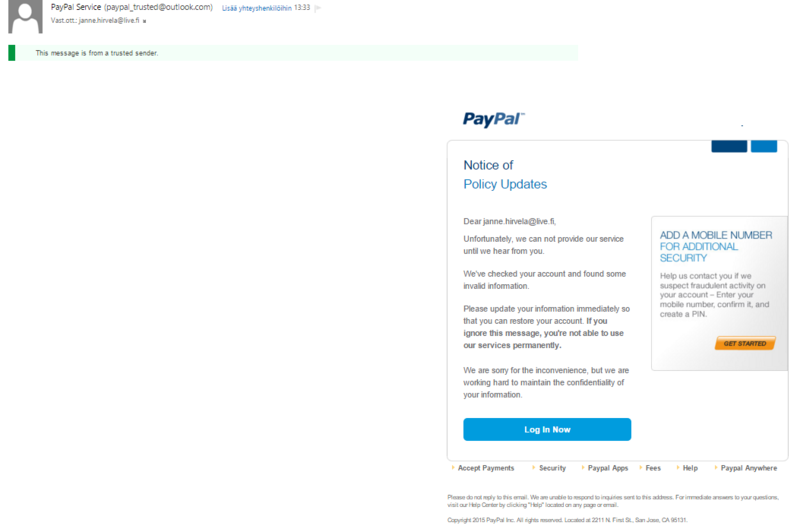 - It it's a scam, have the scammers read up on PayPal and now found fixes to such things as the generic greeting? Thanks for posting in the forum and for sharing your concern regarding these emails. One way to recognize a genuine email from PayPal is checking the information that is requested. We will never ask for your personal or account information such as credit or debit card numbers, bank account details, driver's license number, email addresses, or passwords. Please never click a link in an email that requests personal information. Any time you receive an email about your PayPal account, the safest and easiest thing to do is to open a new browser, enter https://www.paypal.com, and log in to your account. You can also send us an email by clicking on the "Contact Us" link at the bottom of every PayPal webpage. This is a spoof ? It really looks very professional, when I went to paypal.com and logged in there were no special instructions or limitation issuess with my account (I did NOT log through their link!). We've sent email to you a little while ago, that we ask for your help to resolving an issue on your account. Your account has been limited until we hear from you. While your account is limited, some options in your account won't be available. We aim to review your account within 72 hours. Please log in to your account to see the steps , and you'll need to complete your account. If there is no steps are currently listed, please check back in 24 hours. If we don't receive the information before this deadline or we notice additional significant changes in your account activity, your account access may be further limited. Copyright © 1999 - 2015 ΡayΡal Inc. All rights reserved. Please do not reply to this email. We are unable to respond to inquiries sent to this address. For immediate answers to your questions, visit our Help Center by clicking "Help" at the top of any ΡayΡal page. I just received an email too, asking to log in into my account to remove limitations. The email is from "paypa.valid". And when you press Log In sents you to a website that looks like Paypal. Unfortunately, we can not provide our service until we hear from you. We've checked your account and found some invalid information. Please update your information immediately so that you can restore your account. If you ignore this message, you're not able to use our services permanently. I go the exact same email today as well. Like you I changed all my security settings and removed my credit card info. I luckily didn't put any information into the link they sent me because I logged in through my normal paypal link in my favourites folder and saw that there were 0 notifications. To be safe I think I'll be holding off on using paypal for a week or 2 and leave my accounts info blank for that time. Please let us know if you need anything else in future.